Jesse Fink, the author of a new book about AC/DC’s Bon Scott claims that the singer died as a result of heroin and not alcohol poisoning. Bon: The Last Highway: The Untold Story Of Bon Scott And AC/DC’s Back In Black is out today via Black & White Publishing and examines Scott’s life and the final hours before his death in East Dulwich, London, in 1980. An exclusive extract and interview with Fink are featured in the new issue of Classic Rock, onsale on Friday and available to subscribers today. Fink, who also wrote The Youngs: The Brothers Who Built AC/DC, challenges the widely held belief that Scott died after a night of heavy drinking in the city’s Music Machine club. He credits the work that Geoff Barton carried out for his groundbreaking piece on Bon Scott for Classic Rock in 2005, where the journalist brought to light new information about the mystery surrounding Scott’s death by interviewing UFO pair Paul Chapman and Pete Way. Fink re-interviewed Chapman and Way for the book, tracked down other key figures including Scott’s former girlfriend Margaret ‘Silver’ Smith, and uncovered new information with regard to what happened between Scott and Alistair Kinnear leaving the club and the singer being found dead in a car outside Kinnear’s flat the following day. Fink tells Classic Rock: “I spoke to both Chapman and Way for many hours, going over the sequence of events that Barton had laid out in his piece for Classic Rock. And what I discovered, the deeper I looked into it, was that Chapman and Way’s stories actually held up when it came to important, substantive details. 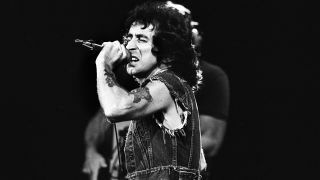 The AC/DC Quiz: how well do you remember the Bon Scott Era? Fink continues: “The difficult part was reconciling Chapman and Way’s stories with the accounts of Joe, Silver and Kinnear, all of whom had their own versions of what took place between when Bon decided he was leaving his flat in Westminster on the night of February 18, 1980, to when he was pronounced dead on arrival at King’s College Hospital the following evening. The time-lines were all over the place. He adds: “Then there was a breakthrough in my own investigation, involving Peter Perrett’s wife, Zena Kakoulli, who said she went with Bon and Alistair to East Dulwich after they’d left The Music Machine – she was inside Alistair’s apartment when Bon was in the car outside – and an eyewitness at the club who saw Bon ‘stoned’ on what this person clearly believed was heroin. “That cast a whole new light on my interpretation of events. Clive Edwards, the drummer of Wild Horses, also told me Silver was at Jimmy Bain’s house snorting heroin when she got the call on the evening of the 19th to come to the hospital – not at home, as she claimed. The full interview along with the cover story featuring excerpts from the new book along with an exclusive interview Fink carried out with Silver Smith before her death in December last year, can be found in the new issue of Classic Rock magazine, which is out on Friday.